Songs and fingerplays, many of which are set to familiar childhood tunes. 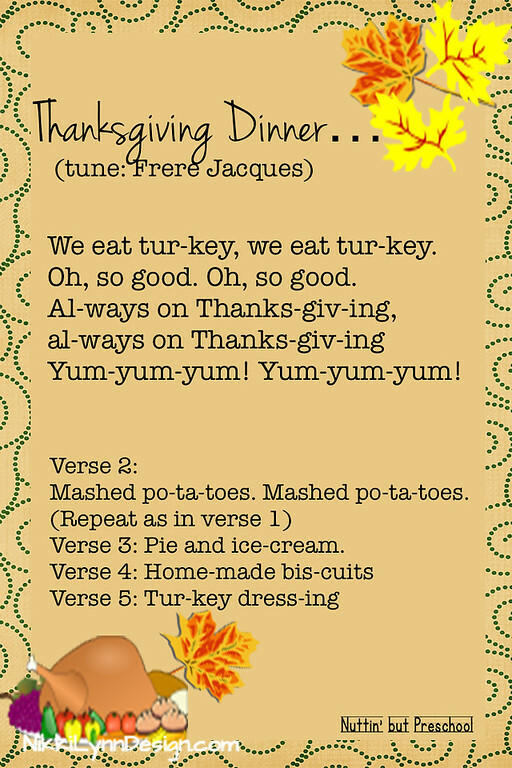 Copy the graphics and save to your phone, iPad and / or Pinterest and bring up the songs during group time activities. Using a grocery bag with a square bottom. 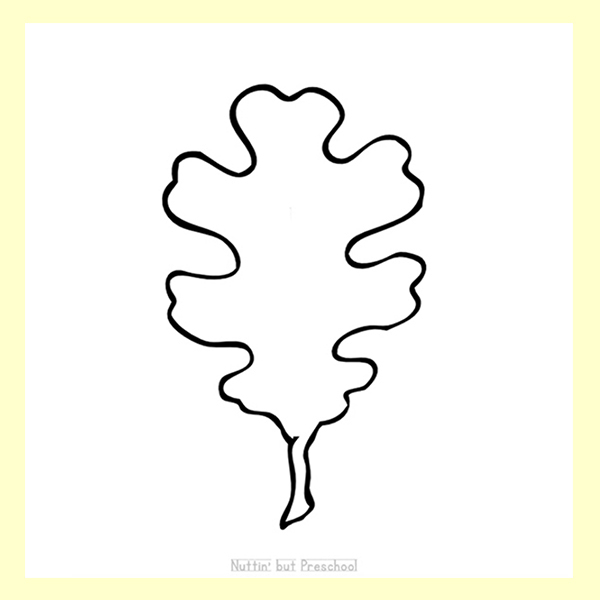 Fold the bag flat for coloring purposes. 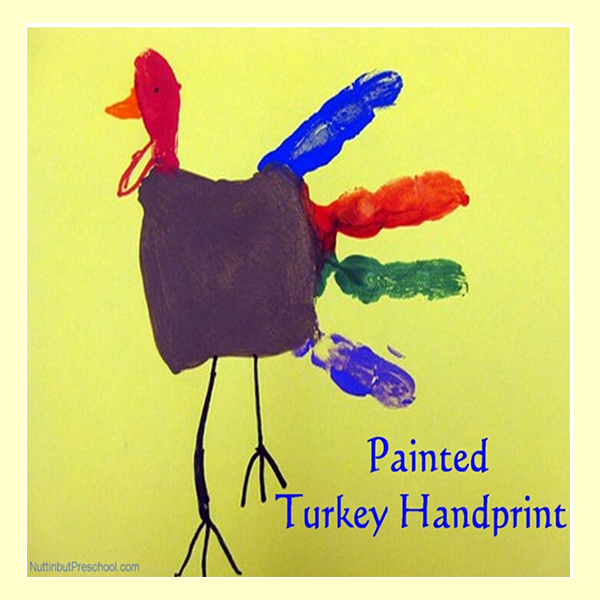 Use brown crayons to color feathers on the turkey. The open end of the sack is used for bright tail feathers (top). Stuff the sack with newspaper and use a rubber band to close it off. 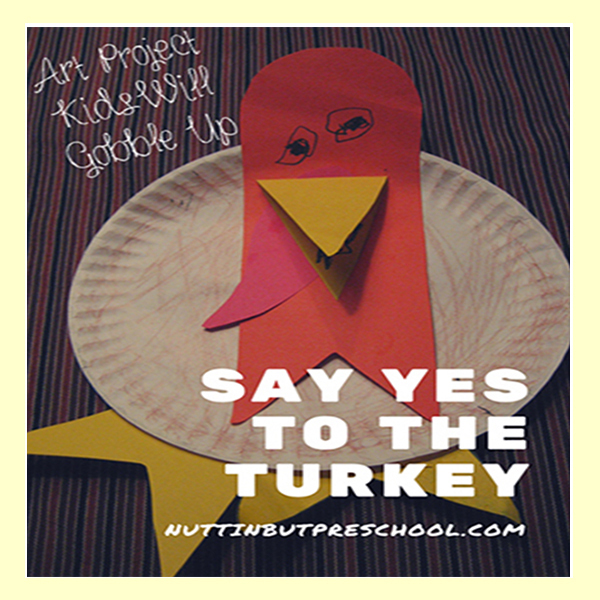 Cut out a head for the turkey and attach it to the square end of the bag along the sides. Spread out the top of the bag (the feathers). 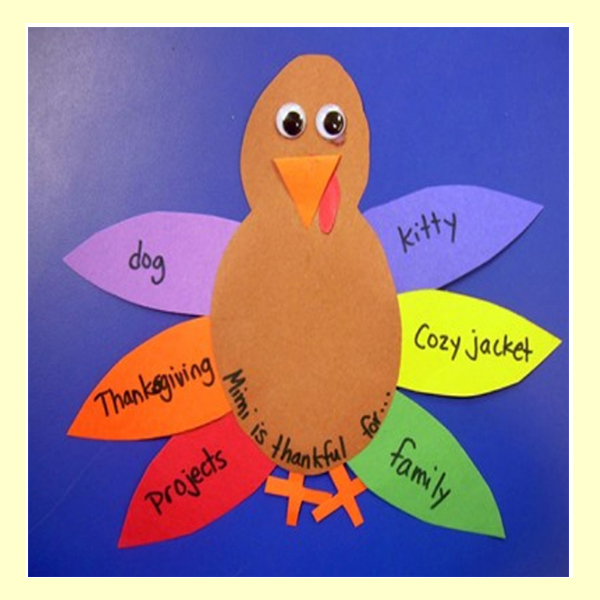 Have the children cut out pictures of items they are thankful for out of magazines. Mount them on a big piece of tag board as a group for display. and add the following poem. Like this one to you from me. Can you see what makes him different? Do you need some helpful hints? 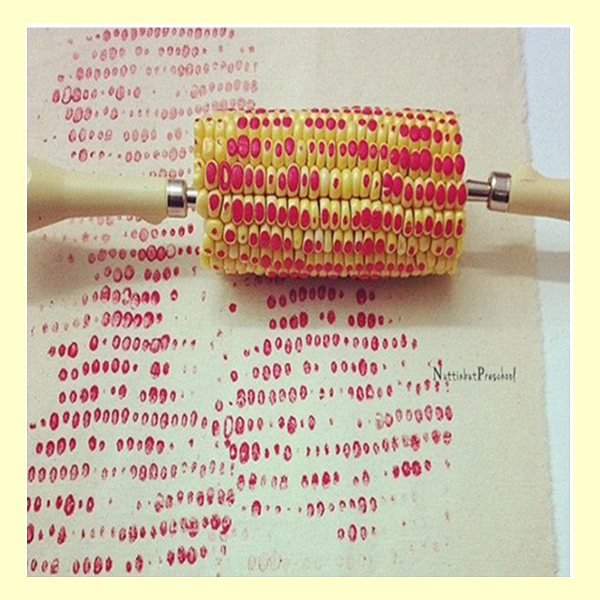 Give each child a stiff piece of paper with the outline of a corn on the cob using pattern here. Have the children fill the inside with real popcorn kernels or popped popcorn tinted with different shades of tempera paint. The husks to the corn can be added by using crepe paper. Find the directions and picture on my site here. 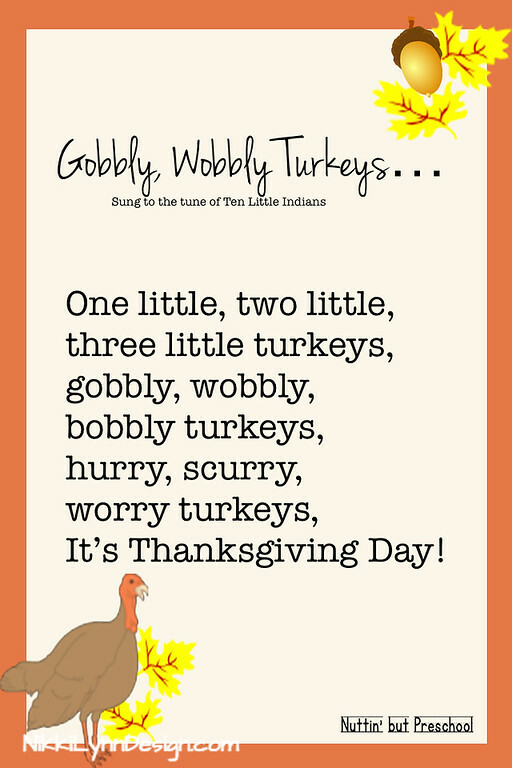 Make several turkeys, pilgrims and teepees. 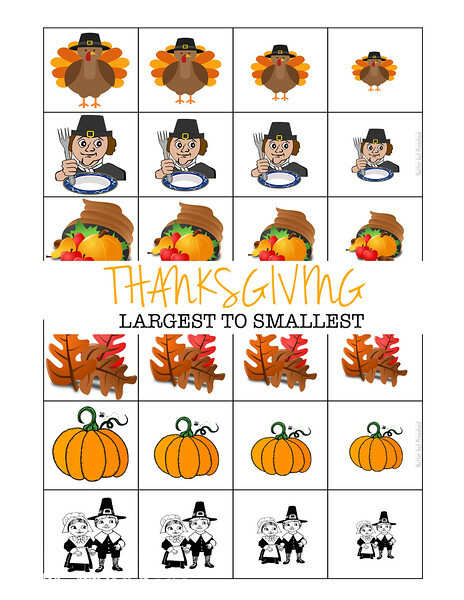 You can use a flannel board or use this as a center activity. 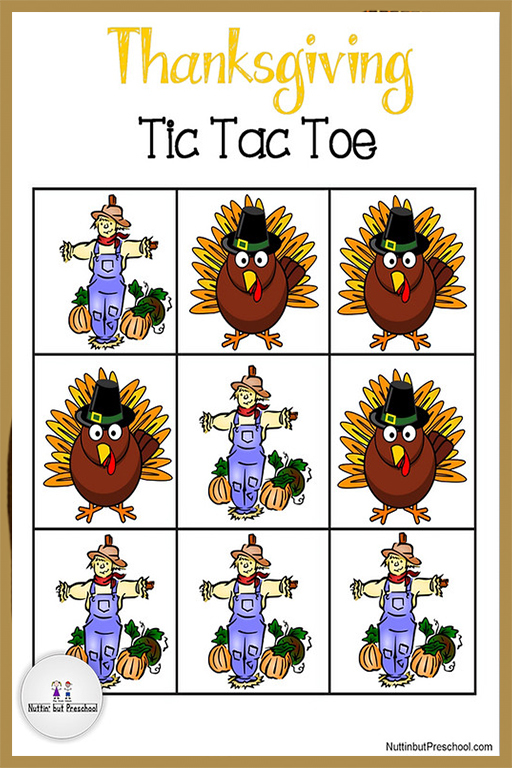 If you use a flannel board have children match teepees to Indians, turkeys to Pilgrims, and so on. Set up an indoor farm market. Ahead of time purchase inexpensive pumpkins, squash, gourds, baskets, wheelbarrow and a few bales of hay. Set up an indoor market for the children to play in. Have the children to pretend they are making Thanksgiving stew. 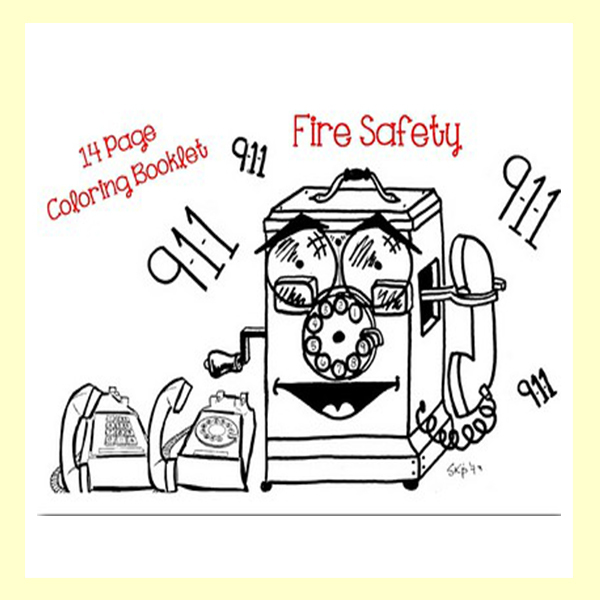 Place a number of items such as plastic meats and Playtime Veggies, spoons, ladles, bowls, salt, pepper etc. Cut five turkey body shapes from brown felt and 15 tail feathers from red, yellow, and orange felt. 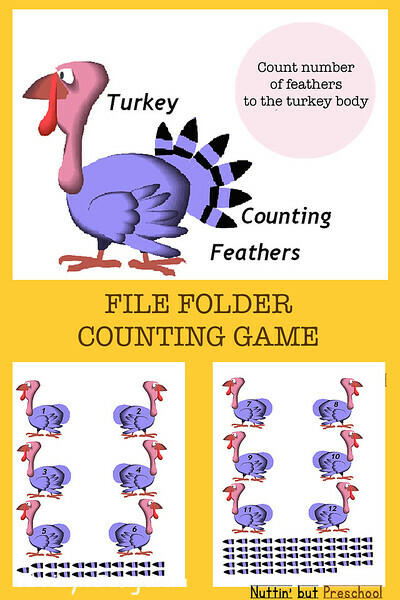 Number the turkey body shapes from 1-5 and place them on a flannel board. Put the feather shapes in a pile. 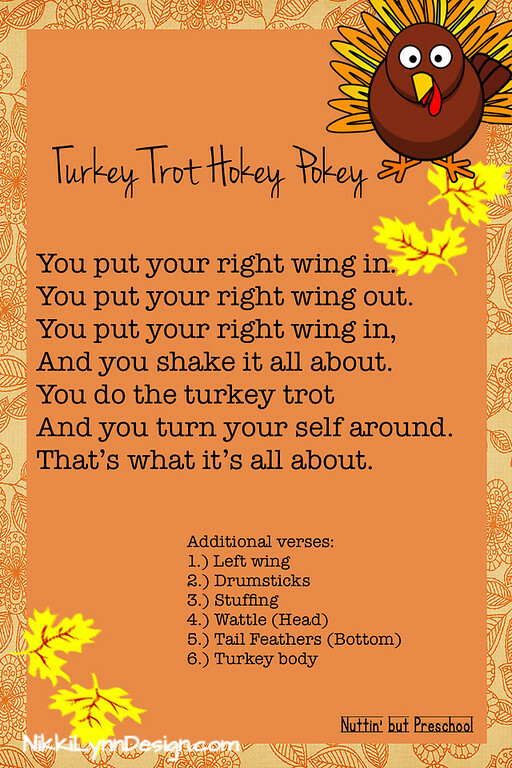 To play the game, have your children take turns selecting a turkey and placing that many feathers on it. 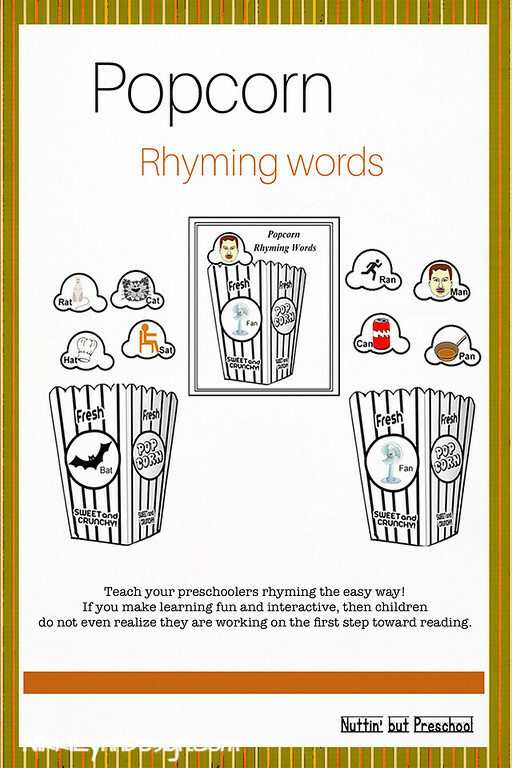 Find the printable PDF and instructions here. To play this game you will need a hula hoop for every two children. The hula hoops are to be the turkey’s nests. Have the children walk inside the hula hoop pretending to stretch out their necks and scratch at the floor while moving around their nests. At the teachers signal (Turkeys in the nest) all children must hurry back and sit in the hoop. Choose teams. Two children, one from each team, run turkey fashion from one line to another. They must also gobble as they race. If one gets out of position to gain speed, he or she is taken away by the farmer (you). The team to have the most turkeys left at the end of two races wins. 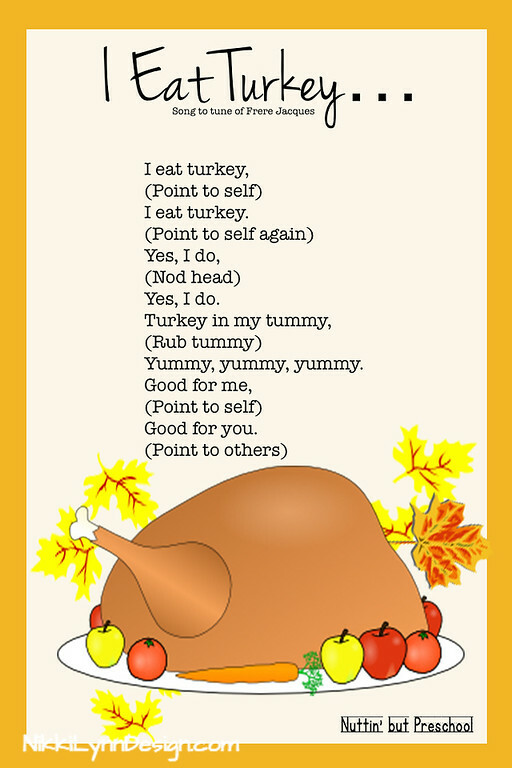 All the children are turkeys except one who is a Pilgrim. The Pilgrim chase the turkeys until he catches one. 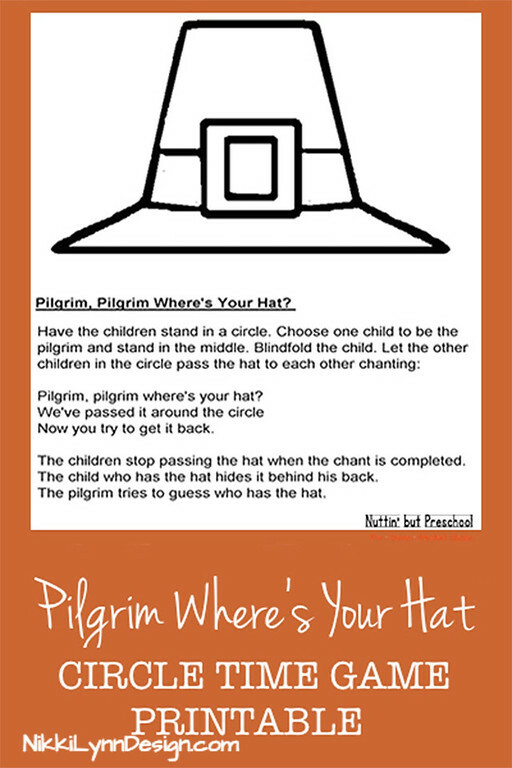 The child who is caught becomes the Pilgrim. Discuss different types of corn, such as popcorn, Indian corn, and sweet corn. Have children plant a few kernels of each type of corn in labeled cups of soil to see if the corn looks the same or different as it grows. Maybe you could have them go further to see if you don’t water one what would happen. How about if the plant doesn’t get light? Offer the children freshly cooked corn on the cob, canned corn, and frozen corn. 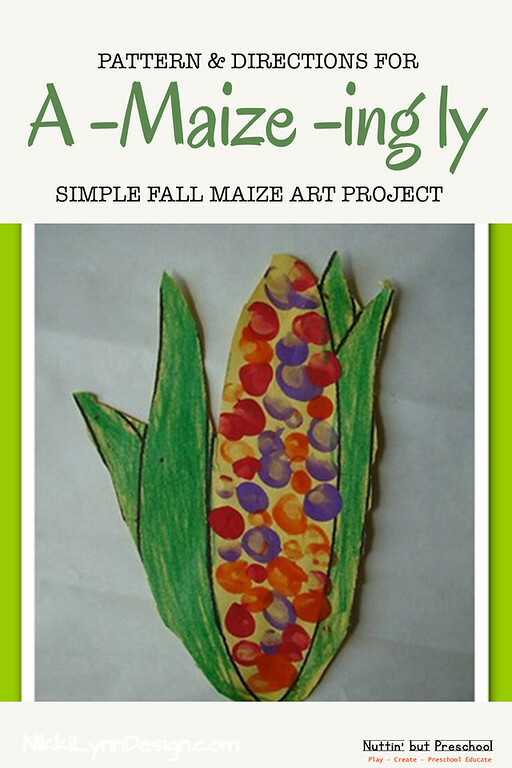 Let them discover how the various types of corn are alike and different. Taste test and graph favorite. Combine the cream cheese with the cheddar cheese. Form into a ball and roll in the sunflower seeds. Chill in refrigerator for a couple of hours. The celery and carrots become the turkey’s feathers by pushing them into the cheese ball. 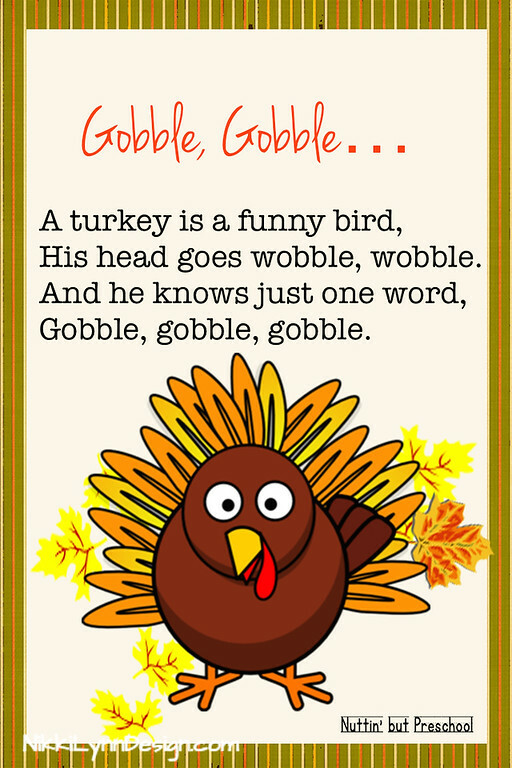 The head of the turkey is made by attaching small pieces of apple and celery to the ball with toothpicks. Serve on crackers after removing the toothpicks. 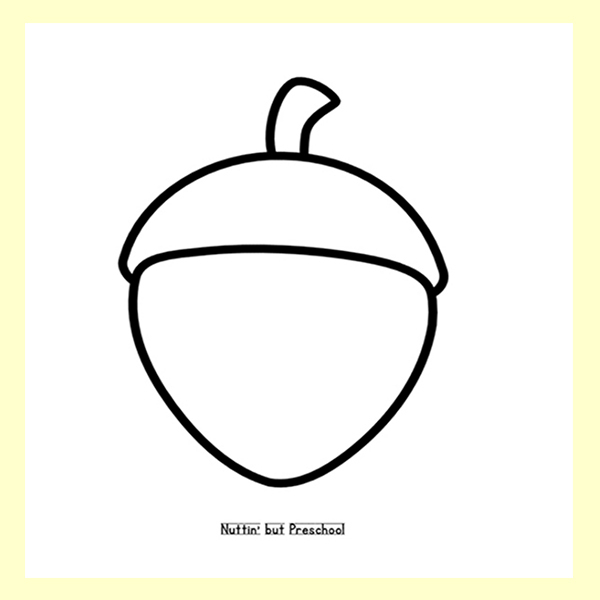 Make this fillable Pilgrim top hat. You can fill it will popcorn for a quick and easy snack. Directions and picture found here. You find my cute cornucopia snack here. Amazon STEM Club Toy Subscription Ages 3-13 STEM toys are handpicked by Amazon’s toy experts each month to introduce simple STEM concepts that can help build the foundation for more complex concepts as kids continue through school. 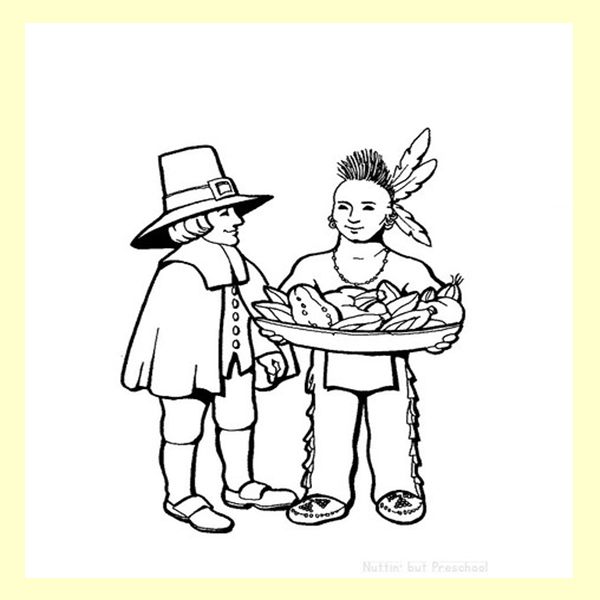 History records that during the first hard winter, the Pilgrim’s daily ration of food plummeted to 5 kernels of parched corn daily. I show the children 5 popcorn kernels and we talk about how we might feel if that is all we have to eat! This is very impressive to the kids when I put the kernels on a regular size plate. Not much there! 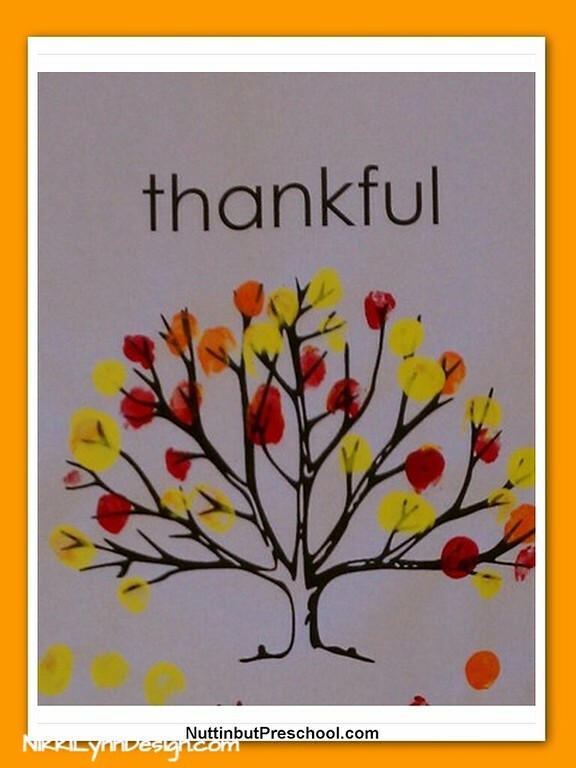 I also give the children a small bag containing 5 pieces of candy corn attached to a note explaining the custom of giving thanks for 5 things before we eat Thanksgiving dinner in remembrance of those 5 corn kernels that were all the Pilgrims had to eat. The first winter the Pilgrims spent in their new home was very cold. Food was in short supply. Some days they had only enough food for each new person to have five kernels of corn for the day. Finally, spring came. They planted food and it grew. All the Pilgrims did not die. 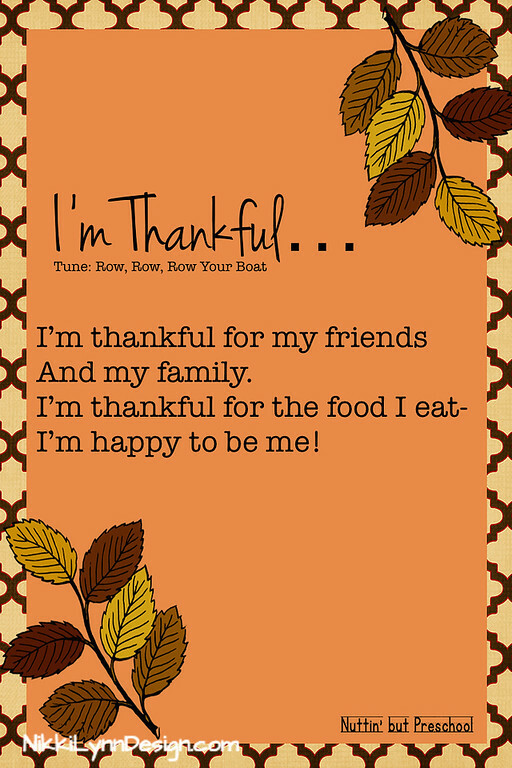 From then on, when a time of Thanksgiving came around, the Pilgrims put five kernels of corn on each plate to remind themselves of their blessings. The third kernel reminds us of God’s love and care for us. 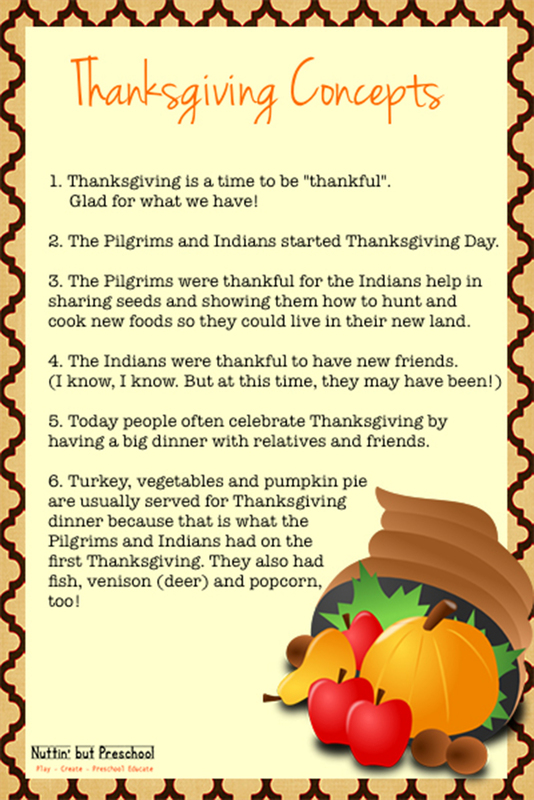 The fourth kernel reminds us of our friends-especially our Native American brothers. The fifth kernel reminds us that we are free people. baggie as we do this story. We also compare and contrast different types of corn (feed corn, popcorn, blue corn from New Mexico, ornamental corn, etc.) in our Science center.